Discussion in 'Work in Progress' started by orSQUADstra, Jan 3, 2018. In-depth, polished interface and GUI elements! A clipboard system, like you've never experienced before! Third party program support - Write your own programs in GML! A built-in store - find neat apps for GM OS and download them with ease! Set up multiple User accounts, if needed! click on Watch Thread to get notified with every small update I'll post here! JON213, FB-Productions, Posho and 20 others like this. Looks amazing, and this post is very well done as well. Best wishes! Working on the system preferences right now! After I finish the most important things in it, and I add a few other important things to the "OS" itself, I'll post a download link to try it out! Hopefully it'll be done in a few days. Hm... I will be writing a .shl at some point I think. Will you just be giving us an exe? Or will you do it open source? I think if it was open source it would be a lot easier to write applications for it. Otherwise we would need a very detailed explanation of how all the parts interact. Like, how would we create a new window, in what ways are views used, etc. I'll just give an .exe, but once I feel like all crucial parts are just like how they have to be, I'll make a guide to how to make your own .shl. I'll make it as simple as I can. For example, for a create event, if you don't need any variables, it's enough to just leave a window_create(width, height, title, resizable) which sets all the variables for you, and for the draw event only the draw_window(x,y,w,h,title,resizable) is enough. For the step event, I can't make it all in script, but I'll just post the short block of code to put in it. Just that itself is enough to have an empty window. Since I don't want it to be 100% open source (for now at least), I'll just simply explain every premade script, how to use, what it does. Of course if anyone needs some assistance in the making of a said .shl, I'll gladly help them out wherever I can! So far what you could've seen in screenshows with the name of "Testprogram.shl", it was an empty window, now I recreated the code with the current scripts and made it into a prorgam that if activated it changes the theme color based on make_color_hsv and current_time. Context menus on the way! Which design do you guys prefer? Spoiler: Design from a previous fake OS of mine. 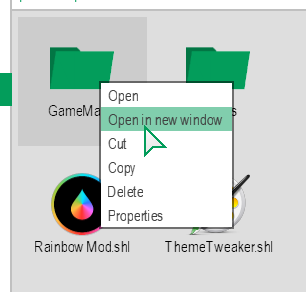 If you think the second one is better (just imagine it with a bit less transparency), I can rework the current filebrowser to look like it. The blur would be static, which means when you set a wallpaper, it also generates a blurred one and the windows will use that. Cool, but can it run Cry..err..Tetris? I like the icons on the left from the previous version and the lack of transparency of the current version. Hey, if someone writes Tetris for it then sure. Would you like to have a try-out version sooner but with fewer things, or wait more and have the first impressions with having more features and overall more functionality? If you're okay with fewer things, I can most likely push out a download for it on this weekend. Best to wait with a comfortable impression of more function and features. But I would like a download, editable, and be running on a Raspberry Pi. But that's just me. Just a screenie of how things are lookin' right now! I'll try my best to finish these ASAP, hopefully will be out tomorrow! Does it have resizable windows? Yes, it supports resizable windows. Note: the guide is not finished yet, but by the time I release the first .exe, it will be! Even though you can already get familiar with how the windows work, etc. Ooh, I remember when SubOSes were a thing in GM. This one looks particularly promising though, and I'm excited mess around with shell programs when you release it to us! One thing that comes to mind though is that I remember, at least on the old forum, that these kinds of programs are forbidden. I think the reason was because they seemed "dangerous." I don't think your program is dangerous if it doesn't mess with windows and uses a sandbox, but I thought I'd let you know. Yes, I've talked about Nocturne about that, and he said it's fine. Of course GM8 is sandboxed, but also has these object_add functions that are important for this project. 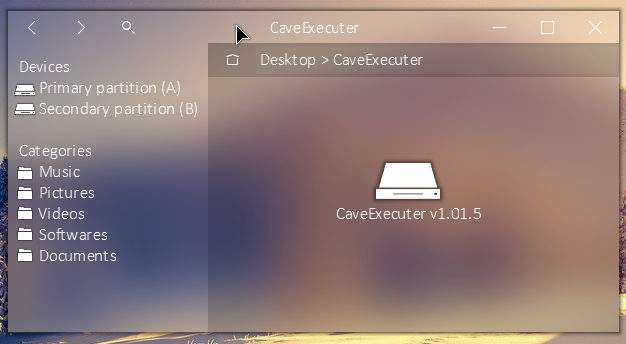 Well now, of course I don't want people to accidentally mess their own system so I made my own way to make it sandboxed. Well. Kinda. The filebrowser has a "safety lock", let's say, which when you change directory will always check it, and if it's outside the working_directory+"\OS\", then it throws you back in there. If you ever make it open source though.. I most likely will, but not in such an early phase. Change the dock to a taskbar which is far more productive than a dock, but I'd like to see a global menu which is one of the things MacOS got right! 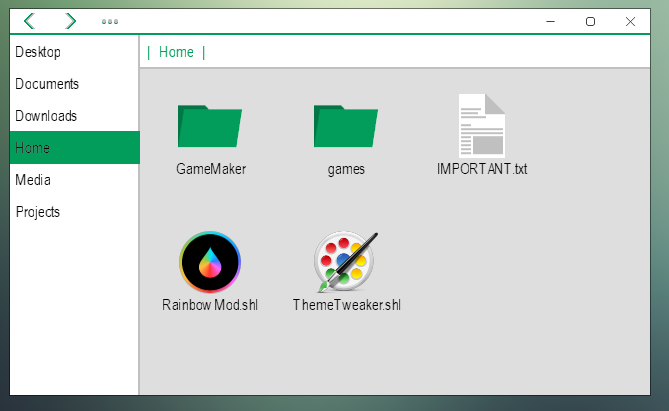 Is this meant to just be like a better file manager for Game Maker? Would be cool if you could edit levels, sprites (with a pseudo photoshop or pyxel edit), maybe even a sound editor. Is this meant to just be like a better file manager for Game Maker? It's just a fun Sub OS made with gamemaker. The purpose? The purpose is to get myself more familiar with arrays and the file functions. Which I did, so that's great. But now, I'm just trying to see how far I could go with this project, how can I make it better. It also has some kind of an aim to be a community project I guess, as I made it so you can make 3rd party programs for GM OS. All you need is to know some of the obsolete functions, possibly read the guide I made, and (what I assume most of us do,) know GML. I said it earlier, but I think it would be cool to turn it into a 'hacking' style game - using the OS as your interface for the game. Samuel Venable, Gamerev147 and Ladi_Pix3l like this. The .shls are to be written in gml though. I'm still working on it, just been quiet here. And the changes weren't too major either.. Just smaller bug fixes and UI changes. I need to change the whole start menu though. Sorry for not posting anything here for a while now, I was very sick for a week and had to learn a lot for school aswell. But once I think the build I have is worthy of posting, I'll make sure to post it. Well, the base idea of making a SubOS with gamemaker wasn't really mine as many attempted it before. The problem with these, is that most of them were silly, small concepts that has no actual functionality. I rember I saw one on the old sandbox which was a Windows 98 knockoff, where the window system was more or less working good, and had a file explorer, but it really was just displaying folders and nothing else, you couldn't do anything with them. And then, buttons on the windows were bugging in and out. Liam Jacobs and Carloskhard like this. Well, I can't wait to see the first release! Is this being developed in GMS1 or GMS2? I reckon I would be able to port this over to GMS1 if it's ever released as an open source project. Nevertheless, will be following the progress of this project religiously as new updates come out . Samuel Venable and orSQUADstra like this. Gamerev147, Liam Jacobs, andev and 1 other person like this. The way Shell programs are going to be written - it'll be simplified. I'll go into more detail once it's actually mostly finished, I'll make a post about that in the Shell program guide thread. Whenever opening something, you'll have that window pop up. 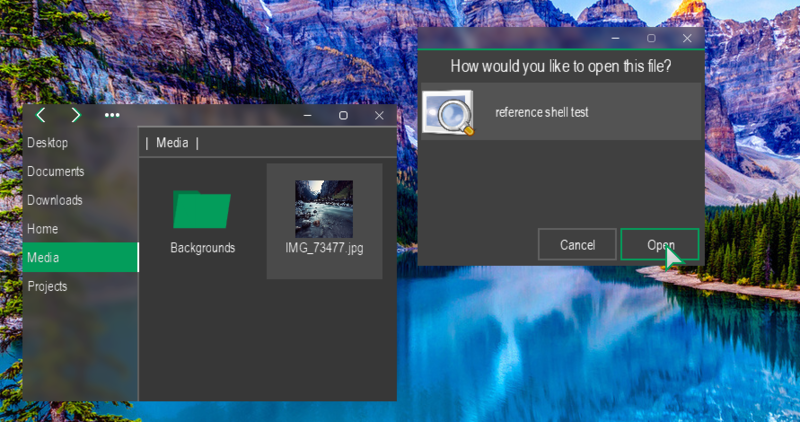 Pretty much the same as what you see in Windows when you click on an unknown filetype - it brings up a list of options to choose from, which program you would like to use to open the file. If you want a Shell program to appear there, (like the "reference shell test" in the image,) you'll have a text file in your .shl folder where you'll have to set a variable: toolmode=true. That will make GM OS recognize the Shell program as something that can open files. Now, if your shell is being opened through that window, your shell will have a variable set (not sure what it will be named yet, for now I used "test", but I sure as heck will change that to something else). That variable is a string, and contains the path to the file. Otherwise, that variable will simply contain "". And, there's another thing that you need to do in order to get your Shell to appear there, as well as in the "installed shells" section - when you right click on your Shell icon, you'll see an option in the right click menu: "Root Shell". This will copy the shell into a folder specifically for Shells that the system will read. That's it for now, and for the meantime, I'll be reworking the home menu/screen. Cheers! Gamerev147, trg601, Liam Jacobs and 1 other person like this. 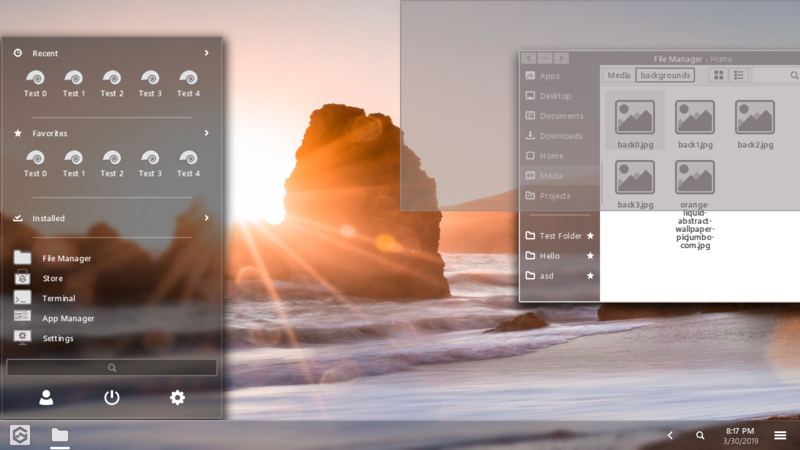 But now, here's a question to all of you: Would you prefer if I switched from Dock to a Taskbar? It could stilll be resizable, and you'll also be granted an option in System Preferences where you could set a gap between the taskbar's horizontal edges and the edges of the screen - making it have some sort of a Dock feeling for whoever might prefer that. If you want a Shell program to appear there, (like the "reference shell test" in the image,) you'll have a text file in your .shl folder where you'll have to set a variable: toolmode=true. That will make GM OS recognize the Shell program as something that can open files. Now, if your shell is being opened throught that window, your shell will have a variable set (not sure what it will be named yet, for now I used "test", but I sure as heck will change that to something else). That variable is a string, and contains the path to the file. Otherwise, that variable will simply contain "". This whole project is incredibly professional. I used to be part of a big SubOS development community when such programs were banned from the 'GMC,' and this is the most effort and polish I've ever seen put into a SubOS. I'd love to find some of the other SubOS Dev members like Loaf or Brother156 to get their take on this, but I have a feeling that people like that will never be found again, sadly. Finalizing things here and there for the first public release. 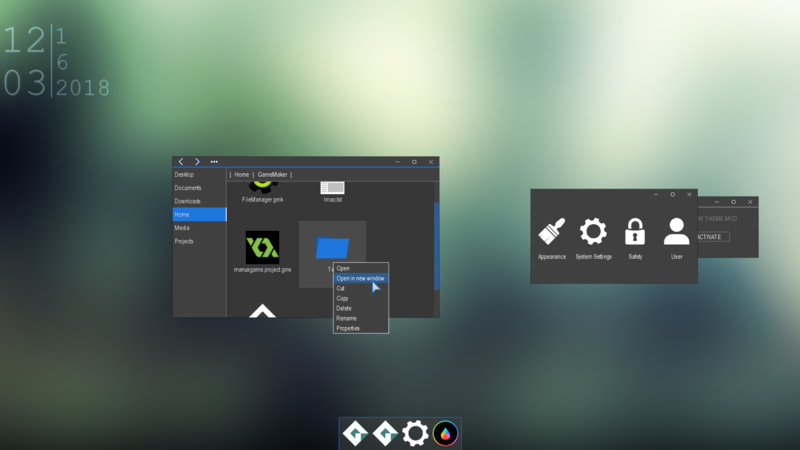 It might take some time though, as I decided to drop the idea of having a simple Dock, and went for a fully customizable hybrid of a taskbar and a dock, where you can set almost everything, and which will even be able to have widgets on. 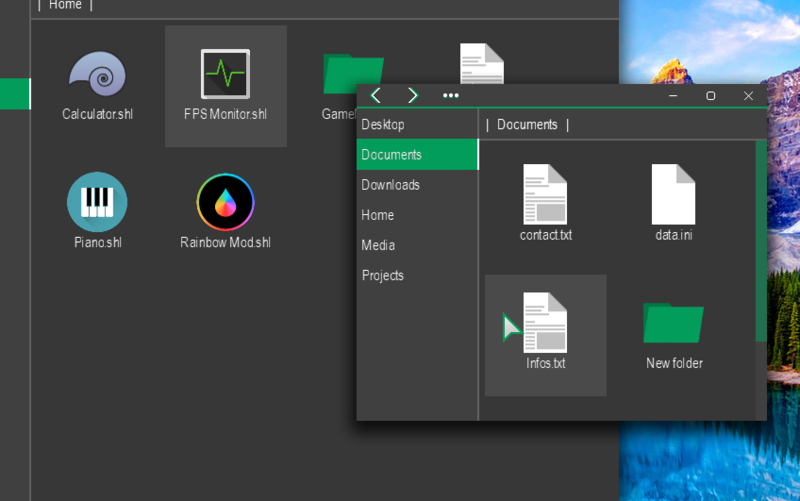 One thing to note, is that everything is still very early - for example, in the file explorer, most of the options context menus offer doesn't actually do anything, and many file types still don't have context menus at all. But I have a question: If I were to make a youtube channel dedicated to this project, where I would post frequent updates of the progress of the OS, make a tutorial series for making your own Shells and widgets, and probably have one or two videos where I would just talk about something, would you guys be interested in it? I'd certainly watch something like devlogs? Just a concept - Why not make the dock / taskbar hybrid something you can switch between in the settings? Liam Jacobs and hamdrax24 like this. Whenever you're ready, man! Also been working a small project. You should consider adding these UI elements to the marketplace, and make them easily skinnable. 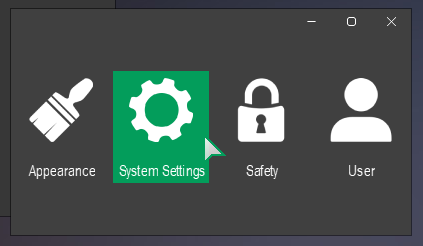 I've yet to see a 'window' system on there. Let alone one with the ability to anchor elements inside of a window and have them move with it. Why haven't you tried this? Someone wrote a GML interpreter, I can't remember who, but it is written in GML so it is cross-platform. If you need to break out of the sandbox for free, I have 2 extensions you can use on Windows, Linux, and potentially Mac as well. If you have any experience with VBScript or JScript, that could also be used in place of execute_string/file. Also, YoYoGames can't copyright GML, there are copy-cat game engines that use GML as a base. I won't mention their names. I'm not allowed to. The only reason I'm telling you this is because this is how I know there are no copyright issues with this. If there were, YoYoGames could take legal action to put an end to those game engines permanently. They haven't, because they can't, even though they may want to. Somehow I didn't have any luck using or even understanding interpreters. These marketplace items do seem pretty convinient, but still I'd have to stick with GM8 for execute_string as I couldn't really get parsers to work in GMS 2 and I have no experience with VBscript or JScript at all.. But thanks for mentioning these nonetheless!